Assistive tool kit helps users to systematically read, organize and retrieve key information when studying or composing text. 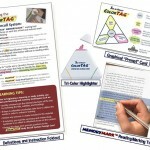 Helps readers to easily and efficiently read, recall and use key information. 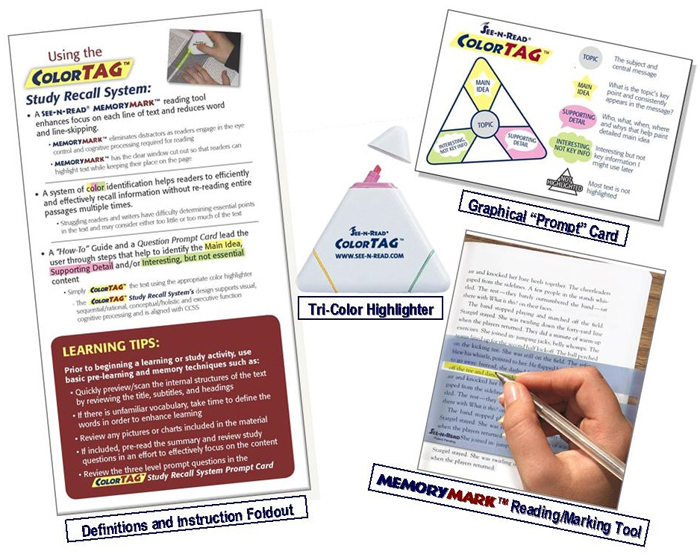 Specific color-based process and tools help readers and writers to quickly identify the main idea and supporting details when reading text or in compositions. Aligned with Common Core State Standards and STAAR™. For any skill level Grade 6 and up. 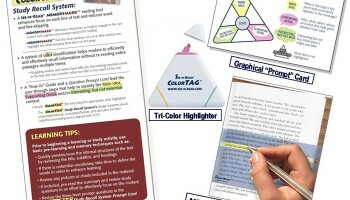 1-Pack includes: 1 tri-fold card with definitions and detailed process descriptions (for reading and writing), 1 graphical Prompt Card, 1 tri-color highlighter and 1 MemoryMark™ reading tool.